Seldom has an introduction to a book of art theory contained so many exclamation marks. Isabelle Graw, who with Daniel Birnbaum co-edited Canvases and Careers Today: Criticism and Its Markets, begins with an exalted, ‘Es lebe die Kunstkritik!’ and concludes her introduction by enthusiastically encouraging us into activity: ‘Let’s get going!’ The publication contains the results of a symposium of the same title, organized in Frankfurt am Main in December 2007 by the Institut für Kunstkritik, which was founded by Birnbaum and Graw in 2003. The aim of the symposium was to discuss the art critic’s changed relationship with art and the market. Canvases and Careers Today consists of five presentations aired at the symposium and each is followed by a critical response. The title of the book and symposium is drawn from a 1965 sociological study called Canvases and Careers: Institutional Change in the French Painting World, which served as the source of inspiration for the initiators of the symposium and as the starting point for the speakers. The authors of the original study, Harrison and Cynthia White, describe the changed world of art in nineteenth-century France. They concentrate on Impressionism and argue that the commodities traded were not so much paintings as careers. According to Graw, whose presentation at the symposium is included as an essay in the series, the Whites remind us that the careers of individual artists are embedded in institutionalized systems of organizations, rules and customs. Structural changes, such as a new market economy for example, entail new divisions of tasks. Graw questions the role of the critic in an age in which artists themselves assume responsibility for supplying the meaning of their works. What, asks Graw, should the form, place and value of texts be in a period in which information and communication have been declared the ‘queens of productive forces’? From a Marxist viewpoint, value is always relative and has to be continually negotiated and determined anew, says Graw. George Baker, editor of the influential journal October and the first contributor, casts doubt on the Whites’ (and therefore Graw’s) sweeping sociological, (neo-)Marxist positioning of the artist. There is no foundation in the suggestion, he says, that a ‘dealer-critic system’ has replaced the time-honoured French academies and salons. Therefore, he continues, the structure, in which, according to the Whites, art dealers, in close collaboration with critics, are supposed to have had a direct impact on the production of the value of a work of art, is in no need of dismantling today. Baker prefers to discuss the autonomy of art criticism. 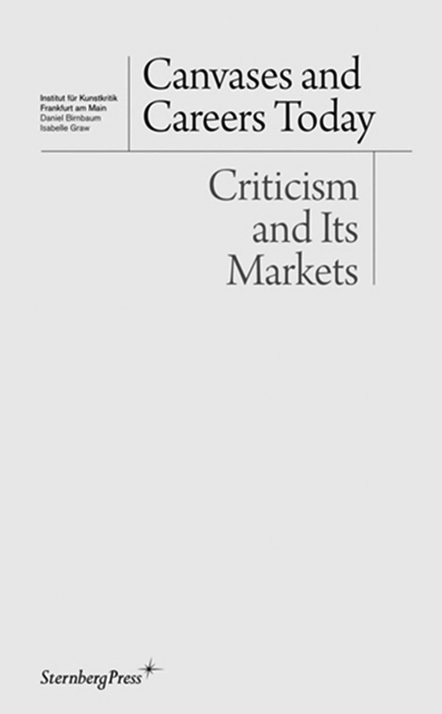 Leaning on the late writings of Theodor Adorno and Edward Saïd, he argues in favour of what he calls ‘late criticism’. It is only through the notion of ‘late criticism’, comparable with the ‘late style’ of an artist which is characterized by anachronisms and anomalies, that the discipline’s own historicity and internal fragmentation, and criticism’s lack of self-regulation, can be considered. Only when art criticism is no longer just preoccupied with its own time does it stand up as truly autonomous. Responding to Baker is André Rottmann, the editor of the German magazine Texte zur Kunst. Rottmann wonders whether this (self-)reflexive form of art criticism can only be employed in the ‘late phase’ of work, in the margin, when death is in sight and one’s own discipline is declared to be ‘old’ or ‘obsolescent’? How, Rottmann asks, do practices like those of Andrea Fraser, who takes (self-)criticism as her point of departure, relate to this idea? Is there not, he says, despite – or thanks to – the current ‘new spirit of capitalism’ precise evidence of a revitalization, and hence a Pyrrhic victory, of art criticism? After all, art criticism is ubiquitous, from panels at art fairs to articles in magazines and monographs. There is no sign that the traditionally mediating and judgmental role of the critic is in any way deficient. Baker’s presentation and Rottmann’s response to it are an ideal illustration of the remarkable phenomenon identified somewhat hastily in the foreword to Canvases and Careers Today, namely that American critics tend to adhere to a more pessimistic view of the future than their European, that is to say German, counterparts. No explanation is given for this observation, but perhaps it lies in the fact that the tone of the discussion around this theme was already set several years ago in the USA. On the occasion of the hundredth issue of the journal October in the spring of 2002, a round table discussion was organized to discuss the state of art criticism which, it was suspected, was characterized by the fact that it had, to a large extent, become outdated and was no longer current. Canvases and Careers Today repeatedly refers to the text version of this discussion in which Baker also participated. In his contribution, John Kelsey, a teacher, gallery owner and member of the artists’ collective Bernadette Corporation, believes that the artist has long ceased to exist; by implication, the critic has thus chosen to question his own specificity rather late in the day. But perhaps the ‘real fun’ of art criticism only begins when it disappears, he says scornfully. Kelsey himself operates from a lack of distance, in contrast to the objectivity that is demanded of the critic. He advertises as a gallery owner in Artforum and also writes articles for the magazine. Kelsey calls himself ‘the hack’. He describes the hack as someone who moves, plays, operates and writes while in the middle of a business transaction. The hack has nothing special to say, says Kelsey, is no genius nor does he claim to have intellectual property. The hack, he says, is empty, an instrument, a post-Fordist virtuoso. The hack appears to conform to the contemporary art system, but was already seen in artists like Stéphane Mallarmé, Marcel Broodthaers and Pier Paolo Pasolini, says Kelsey. What he finds appealing in all these examples is the degree to which they are ‘instances of critical language becoming performative in relation to the movement of capital’. Such a way of thinking and working creates possibilities for an immanent critique, a critique from within that deliberately alienates itself (through becoming performative or fictitious) from the culture of which it is a part, without cherishing the illusion that it can ever effectively change the system. Reacting with scepticism to Kesley’s reading is artist Merlin Carpenter. Carpenter is also sceptical of the incestuous conspiracy of critics, which is how he sees Canvases and Careers Today. They question their own position, yet transparency is a farce, he contends. Every redefinition contains a hidden agenda. Perhaps, suggests Carpenter, citing Lacan, we should ‘shatter discourse in order to bring forth speech’. In reaction to Branden W. Joseph’s contribution, art historian and scholar Tom Holert endorses Carpenter’s commentary to a certain extent. At the same time, Holert manages to skilfully avoid Carpenter’s tendency for destructive and defeatist discourse by beginning his critical response to Branden W. Joseph with a careful analysis of the ‘performativity’ of the criticism he directs at Joseph. Transcending a nostalgic desire for the supposedly lost practice of art criticism, Holert looks beyond the dichotomy of its earlier status and the current situation of society. What’s more, he sets aside the occasionally rather rigid framework set-up by the symposium. The ‘past criticism’ that he refers to is averse to prescribed codes of behaviour, ways of reading and rationality. ‘Past criticism’ is provisionally structured around ‘performance spaces’, a temporary convergence of moments of ‘criticality’. In his reading of the position of art criticism, Holert does not opt for a compulsory, visionary interpretation of the practice, something that many a conference participant tended towards. Instead, Holert concretizes what Andrea Fraser once called ‘site specific criticism’. Just like an artist, he says, a critic has the responsibility of taking stock of the surrounding contexts. These contexts consist not only of the sociological structure in which, besides Graw, Birnbaum and the Whites, the critic is also situated, but appear, judging by the contributions to Canvases and Careers Today, to be much more complex and diverse.